Camp Hansen is located in the northern region of Okinawa, Japan near the town of Kin. 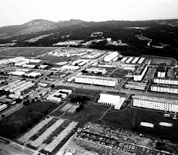 The base is part of the MCB Camp Smedley D. Butler complex. Major units at Hansen include the 12th Marine Regiment Headquarters, the 3rd Intelligence Battalion, the 7th Communications Battalion, the 31st Marine Expeditionary Unit and elements of the 3rd Reconnaissance Battalion. The base has multiple firing ranges and training areas. This Camp Hansen directory features the critical info you'll need to navigate through the many facilities and recreational opportunities available on base.